Let’s talk about an ordeal that some of us face almost on a monthly basis: being broke. It’s never a fun situation. One minute you’re looking at your bank account, pleased at the amount shown. Then life decides to dump those mountains of bills and unexpected costs onto you till it renders the multiple zeroes you once had in your bank to just one—all in a split second. It may not be fun to struggle with this problem in real life, but who’s to say it can’t provide a compelling challenge in the form of a mobile game? 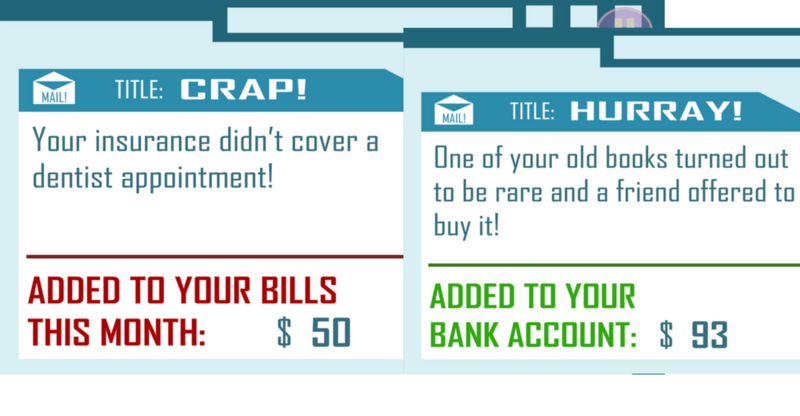 When I found out there was a game that emulated the feeling of going through the early stages of being financially independent and then realising that you’re broke in the blink of an eye, I got curious and decided to give it a go. Because suffering in real life is not enough, I need to experience it virtually too. Hurrah. Crap! I’m Broke is a mobile game developed by Arcane Circus that is available for the iOS and Android. When you first load the game, you’re shown the plot where you’re playing as a guy who recently got a new home in the city. Your kind mother e-mails you saying she’ll help cover your first three months of rent. Once that’s done, you’re on your own in the big world of adulthood. Sound relatable yet? Examples of e-mails you can get. You can then swipe around your new house where you’ll see a refrigerator that has different food to help with your hunger bar as well as a laptop for you to pay your bills and get new e-mails with either good news or bad news. Good news means you somehow got some extra cash to help you through the month. Bad news (which unfortunately you get more of) is some unforeseen expense being added onto your bill payment. Again, can this game be anymore realistic? So to combat these bills, you need cash. How you do this is by leaving the comforts of your home and like any responsible adult, you find work, which you complete in the form of mini-games. Some of the jobs you can do. The list of jobs you can do is quite extensive. 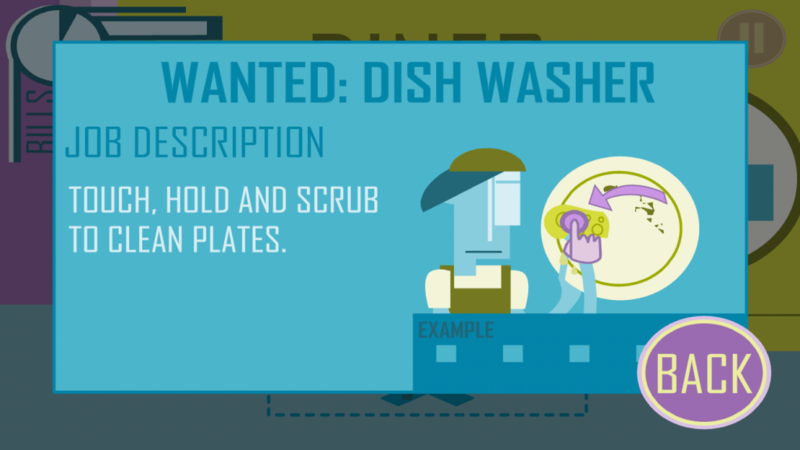 You start out by washing dishes at a diner but the more you pay your bills and earn your keep, you get to unlock more jobs from other nearby businesses. Soon, you’ll find yourself flipping burgers, sorting cans in a factory, bartending, and even being a bouncer for a club. All you need to do is check if there’s a job vacancy sign plastered outside the building before you press to enter. Once you’re done with a job, you’ll be kicked out so just move on to the next available business that has the vacancy sign or take this time to replenish your energy. While doing these jobs, there’re two things you need to be keeping an eye on. The circular gauge shows you what time you have left before the debt alarm bell rings while the bar shows how much your stomach can hold off starvation before you risk death. 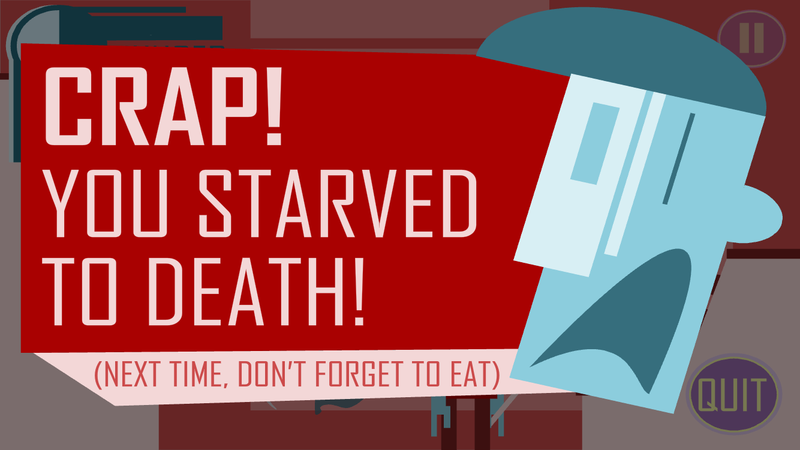 The game does send off a pretty loud warning when you’re approaching starvation threshold and bill time so remember to rush back to your house when you hear the second warning. Well, that’s one way to go. If you don’t monitor these two, you either die from hunger or die from piles of debt. Not exactly the best endings. The controls used in this game are pretty straightforward. You tap on items to interact with them and hold the left or right part of the screen to move the character around. Each job has its own mini-game with its own set of controls. For example, burger flipping is done by you tapping on patties to turn them into burgers while washing dishes requires you to rub at your screen until the grime is gone. Simple and direct, just how I like my controls. Personally, I did face some problems with some of the controls at the jobs. Sometimes during the burger flipping, my fingers may be tapping in a frenzy at the patties but they just end up not turning into burgers. Even in the factory job, the character ends up dropping the can earlier than I want him to so I lose a few bucks thanks to silly mistakes beyond my control. Hoping to see these bugs fixed in future updates. 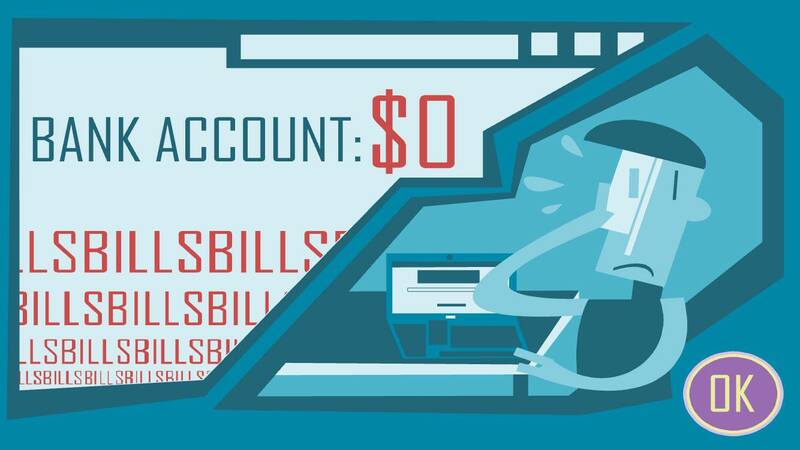 Paying the bills is easy, all you need to do is just go to your laptop and choose the “Pay Off” option. If you don’t do it in time, the debt carries to the next month and you get an eviction notice from your landlord. 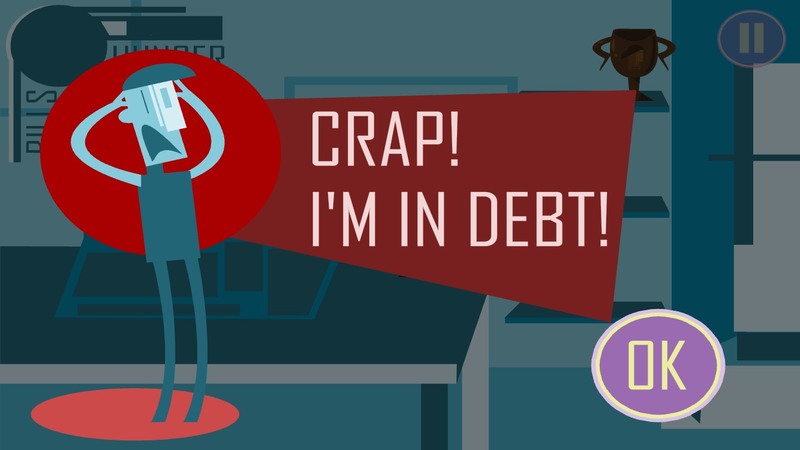 So, it’s best to avoid that debt from piling up too much. When you finally manage to accumulate enough funds, I can’t even explain how satisfying it is to watch the debt figures reduce to zero once you’re done paying them all off. It feels like a legit victory. Before you press that option though, I’d advise for you to replenish your hunger bar first because if not, you’re pretty much screwed with no cash left for the next month. The extra items that can be bought. A tip on earning more cash is by keeping an eye out for the “Employee of the Month” challenges that occasionally pop up. Complete the requirements successfully and you’ll have extra money to tide you over. Also check out the web store that shows up after you complete a level. This is your only opportunity to buy items that can give you bonuses for working certain jobs for the month. If you happen to have extra change, be on the lookout for transients while scrolling through the streets looking for jobs. If you tap on them, five bucks goes out of your pocket. This game does practice a karma system because your generosity could pay you back through the form of lottery cards you can purchase from the supermart. At the start of a new year, you’ll also have the opportunity for New Year Resolutions, like “Go to a gaming convention” or “Visit family.” These are goals that you’ll want to save up for, which will get you some great memories in return, which show in the form of bonus short clips. When you fail to pay the debt. The only real issue I had with this game was how after you’ve progressed into Year 2, the game enters a whole new level of difficulty. I get that the developers want to reflect the hardships of life by shoving more and more financial challenges to you but it’s not fair when the whole world is against you. The further you progress, the wage you get from the jobs aren’t enough and it seems that your unfortunate luck lands you more unexpected costs than you can handle. The only way you can move forward is by praying to the gods for more of the “Employee of the Month” challenges so that you can even come close to paying off your bills without falling into debt or dying from hunger. Other than that, it’s a really interesting game that ends up being addictive because of how relatable it feels. The gameplay may seem simple but that makes it easy to pick up from the get-go. We’re giving it extra points for realism and for capturing the struggle of real life. If you’re already stressed out trying to survive crushing debt, why not live out your fantasies of actually conquering it in this game?